Faith in the City reloaded: Can we build a Good Society in an age of austerity? Whatever the immediate causes of the riots/disturbances that overtook many of England’s cities in August, there is a pressing need to address their underlying causes. Whilst much has been written and said by politicians and pundits in the past 5-6 weeks, it is the communities, families and individuals directly affected by the disturbances who must be at the centre of determining not just what caused them, but what needs to be done in response. At the same time, it is important that any inquiry seeks to explore not just the immediate causes, but the underlying moral, social and economic factors which not only created the pre-conditions for August’s events – but which, if not addressed, may lead to further disturbances in future. What might be termed the ‘urban question’ has been much explored both by the Churches and others over the past 30 years. In 1985 the report, Faith in the City. A Call to Action by Church and Nation, was published by the Archbishop of Canterbury’s Commission on Urban Priority Areas. The report came in the wake of much concern about what was happening in British inner city and outer council housing estate communities. Faith in the City was crucial in sparking new awareness of the emerging gaps in society, gaps which had become painfully apparent in the riots of the summers of 1981 and 1985. In the years since Faith in the City the many of the problems faced by inner city and outer estate communities have failed to disappear. At the same time changes in industry, employment, migration, local government and programmes from central government, have lead to a very different scene in which the churches now engage. In 2003 the Commission on Urban Life and Faith was established to report on the twentieth anniversary of Faith in the City on the new contexts and challenges that exist in our towns and cities. The Commission reported in 2006 through the report Faithful Cities. In spite of all the efforts of the last Government to tackle poverty and social exclusion, the gap between rich and poor hardly narrowed between 1997 and 2010. The gross disparities in wealth and income between rich and poor take many forms and have profound impacts across many areas of life – not just at an aggregate national level – but mirrored in the separate experiences and life chances of rich and poor across the length and breadth of the country. As documented in The Spirit Level inequality is the root of much of the social dis-ease within contemporary Britain: Wilkinson and Pickett demonstrate the dramatic impact that inequality has on a wide range of other measures of health and well-being. Turning to the future, the prospects for overall levels of inequality, for urban communities, and for young people in particular, are ‘poor to bleak’ over the next 3-5 years. All the indications are that these gaps between rich and poor are likely to become even more entrenched over the next few years, as the impact of the Coalition’s austerity measures (the deepest and most prolonged cuts for more than 60 years) start to bite. Independent researchers from the Institute for Fiscal Studies and the Resolution Foundation are predicting that overall household incomes will fall in real terms over the next 3-5 years, as wages and benefit levels fail to keep up with growing price inflation – most notably affecting household essentials (food, gas, electricity). IFS research indicates that the poorest 10 percent of the population will be hardest hit – and face an effective loss of 10 percent taking into account the impact of lower living standards and spending cuts. Within this, 16-24 year olds are one of the age groups most affected by the current economic crisis: Almost a million young people are now not in education, work or training. In the last quarter, youth unemployment rose by 78,000. The future prospects for this age group have also been substantially impaired as a result of Government cutbacks, including the abolition of the Educational Allowance Maintenance (EMA) and the significant rise in university tuition fees. At the same time, the prospects for ‘community regeneration’ look bleak: Whereas the past 10-15 years have seen substantial public and private investment in poor communities, these funds have now all but dried up. Local authorities continue to make deep cuts to ‘non-essential’ public services, which are frequently the life-blood of many poor communities (libraries, leisure, youth services etc). There is little prospect for this deficit being filled by either a hard pressed voluntary and community sector, or by local businesses which are themselves continuing to suffer the impacts of the credit crunch and economic stagnation. One in seven shops across England have apparently been empty for at least a year – and in some areas around a third of stores lie vacant. What does talk of the ‘Good Society’ mean in this context? What can be done, in concrete terms, to promote greater fairness within urban communities as well as nationally? Can we develop alternative economic models which generate/distribute wealth more equitably? What role can faith communities play in these tasks? Faith in the City reloaded? So is it time now to revisit Faith in the City? To answer (or at least to explore) some of these questions adequately? To stimulate dialogue between people living, working and worshipping in urban communities and those in power – in the churches, in politics and in public life more generally? 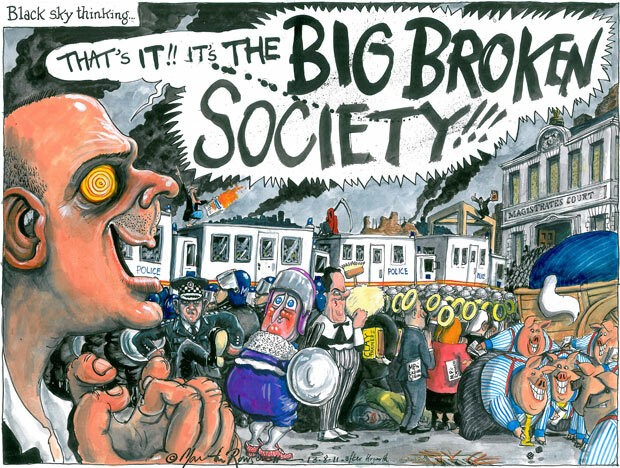 To identify new approaches and new thinking that will help us all to come to terms with the new realities of life in post-riot austerity urban Britain? To find ways of re-imagining and re-embodying Faith in the City? A very timely piece. Looking back over all those years, it’s clear that neither church nor government have got it right. Could that be because when it came to the test, both were too quick to see which side their bread was buttered? If so, how can we change it this time round? Some good thoughts and questions there. Maybe the problem with the efforts in the 25 years since FITC was that we all concentrated on place rather than people (hence Docklands.. london, Salford, liverpool etc), prosperity rather than injustice, and on church as institution and building rather than calling out people to respond to the good news of Christ in community….. Totally agreed. A factor you haven’t mentioned is the considerably changed environment in which the church is now working compared to 1985. At times it would almost seem to have a walk on part in the shadow of the other faith communities that occupy these very inner city spaces; and at the same time has often been marginalised by the predominant secularism of the town hall. That is not to grumble. It is however to recognise that the journey from dominant, and for the CofE established, faith, to a still uneasy pluralism has involved a major loss of identity and confidence. The project of reworking the role, of service rather than dominance as a multigenerational one. For me at least that task of reinventing the place of church seeking the SHALOM of the city (itself a good 1970’s theme) is a dynamic and exciting albeit immensely challenging one. But one of the sad consequences has been a church unwilling to put its head above the parapet in many places, and thus unable in some places at least to be te source of stimukus for change that it might have been. I think that simply revisiting Faith in the City (as Faithful Cities did) will not move things forward sufficiently. What is needed in part is something that will shift the church off its centre of gravity bringing all parts of the organisations together (one of the problems with CULF was it was largely Anglican in identity) and at the same time grapples with the nature of organic movements such as #riotcleanup and Hope08. We also need to invert the polarised nature of urban vs rural as our society needs to see the links between all communities, not simply the bits that seem to be similar to one another. We need to move past distractions such as English Missals and the politics of sexual and gender to name but three. We also need to see a break out of people so that serving the community in whatever fashion (politics, Street Pastors etc) is seen to be part of the mainstream, not simply an important peripheral aspect. This is an equal challenge for the Anglo Catholic as well as the Evangelical. It means a break with our history and what we think is our theology. I am not so sure that ‘Faithful Cities’ did revisit the practices of Community development that were advocated within the Faith in the Cities. It gave a nod in the general direction, it even gave a few recommendations – but it soon became yet another report that was shelved, with little practical application of its own recommendations. * Chapter 12 and 13: Understanding the Principles and Practice of community development work, rather than purely service provision and box-ticking! The value of these two chapters have not been mined – these are very rich seams which go untapped. Faith in the City is too valuable to be left on the shelf – we do not have to keep reinventing the wheel! The vision contained with F.I.C. is too important to be ignored, or simply experimented with here and there – It offers a theological reflection and practical vision for what can be achieved if we do indeed have FAITH in the City… FAITH in our communities.